Happy New Year to all, I hope you have had a good festive break. As always the start of another New Year brings with it the inevitable question of ‘What are your New Year’s resolutions?’ Personally I don’t make them, mainly as I don’t believe in them. Just because the year is one number higher, why does that suddenly mean you are going to stop being lazy and actually do the things you’ve talked about? I’m a great procrastinator (at work anyway), and nowadays blame the internet. I suspect that there is a direct correlation between people who say they don’t have enough time to do things, and those who spend the most time surfing the net and playing on facebook. Maybe everyone should make a New Year’s resolution to go cold turkey and give up the internet one day a week for 2013. If we all did that, and then spent that time buying and reading books, we would make James Daunt and Waterstones very happy! Apparently (well according to Wikipedia, the font of most of my knowledge) resolutions originally stem from the ancient Babylonians who made promises to their gods at the start of each year that they would return borrowed objects and pay their debts. Well that sounds like a silly resolution to me, returning all the books I’ve borrowed and accidently forgotten to give back would take me til 2015 to do. Of course sometimes resolutions do have their place. Take the Hilda’s for example (for new readers this should explain them) Hilda1 is having teeth implants next week to straighten her wonky teeth. After this she is going full out for a makeover with a new hair style and some new clothes. Whilst Hilda2 was talking about going on holiday to somewhere snowy so she could go bottom boarding whatever that is. Never mind that 1 is in their 80s and 2 is in their 60s, its a new year and they are going do something. As Du Plessis says in Wild at Heart ‘Its how you live your life, not how long you live it for that counts’ which the Hilda’s would obviously agree with (although they seem to be going for both how and how long). Whilst I don’t do resolutions, I do like ‘to do’ lists which I suppose in a way are mini resolutions. Lists of things to do over the holiday, lists of housework that needs doing, lists of tv programmes I’d like to watch. My favourite list is my list of books to read, which is a list I’ve never yet completed. For every one I finish I usually add four more. Maybe I should make a New Year’s resolution to actually finish one reading list before starting another. But thats the thing with resolutions apparently 88% of them fail anyway, so why waste time making them! Christmas is coming and I’m pleased to say that I have just completed all my Christmas shopping without even leaving the house! Absolutely the best and most worthwhile use of the internet in my opinion is the world of online shopping. No crowds, no rain and no carrying heavy bags on the bus. It is also the one time that being surrounded by the Hilda’s is actually useful as all deliveries go via them. 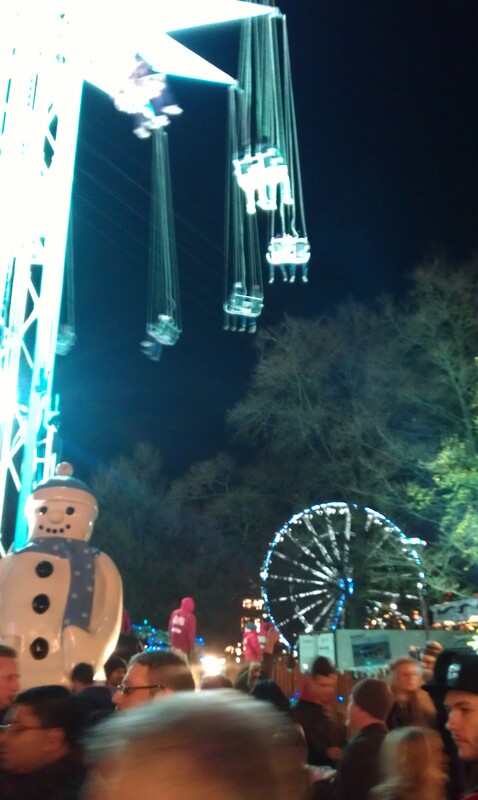 Having recently been down to London and experienced the crowds at Hyde Park Winter Wonderland, any chance to not have to fight through the shops is good with me! 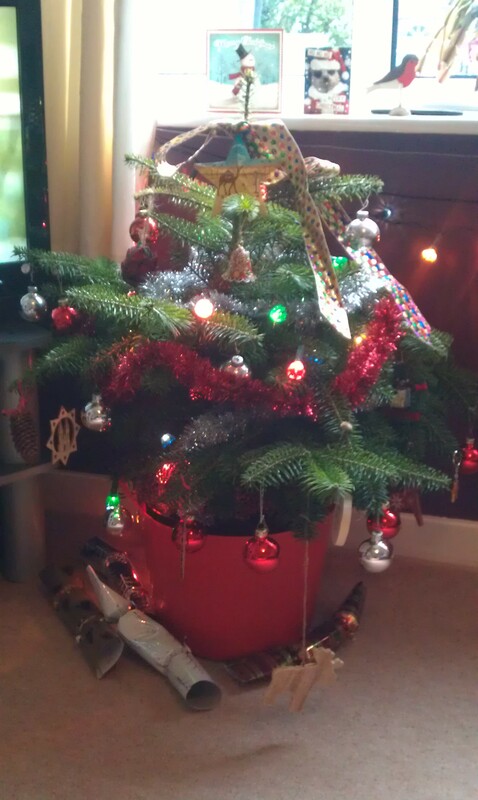 So behold my Christmas Tree, and remember size isn’t important! The other very good Christmas tradition is two weeks off work. This of course also gives me a reason to justify buying lots of books to read during the break. Having them delivered straight to the kindle even means I don’t have to interact with the Hildas! The latest book I’ve bought came from an exhibition I saw in London, Doctors, Dissection and Resurrection Men. The book is by Sarah Wise and called ‘The Italian Boy’. Apparently it reads like a ‘whodunnit’ but is a true story. The book tells the story of the notorious London Burkers who supplied corpses to medical schools in the 1800s which sounds fascinating. 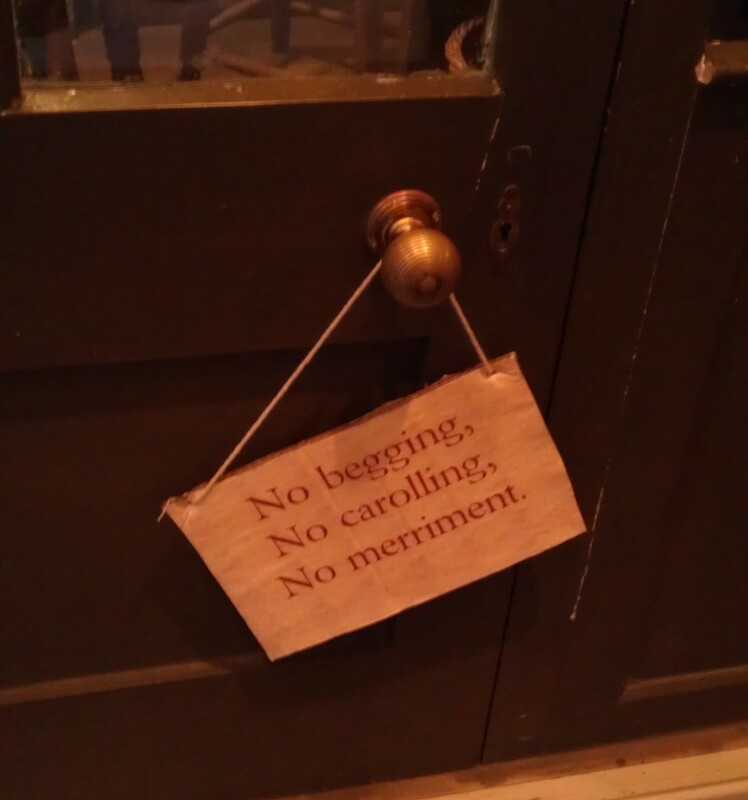 My visit to the Museum of London also provided me with a chance to see what has to be the best christmas sign I’ve seen hung on the door of a Victorian Shop front. I wander if I can get one of these on the internet? Now my dear reader chums (mdrc for short), the eagle eyed amongst you will notice that this is the first non crime related title of the blog. That’s because I’m taking a little, what I call, crime pitstop. Such fun! I like to listen to audiobooks when walking places, its much easier than walking down the road reading a real book, very tricky. My latest was (as the sister and any one who watched her bbc show will no doubt have guessed from the blatent plagarism in the opening paragraph) Miranda Hart, ‘Is it just me?’ Well ‘mdrc’, no it is not just her, its me to! Miranda’s core audience is probably made up of single women over 30 – well that’s everyone elses loss. This was hilarious and in true Miranda style this book had me laughing out loud. Therefore this book has also had the added bonus of making my walk to work alot quieter as people have now taken to crossing the street with fear in their eyes when they see me. Anything to avoid the freaky women laughing to herself! Life is full of these little conundrums, and Miranda covers them all. Hobbies is another good example she uses. Some people do really have hobbies, however let’s be honest most adults when confronted with that question on a job application draw a blank. Out we drag reading, swimming and socialising. In other words, there is a copy of heat magazine next to the toilet, we will occasionally float in a pool on holiday and we go to the pub as often as possible. Sometimes being a grown up is just so boring! Being sensible, paying bills, sitting in an office all day looking at a view of a drainpipe – all that stuff is not ‘such fun’. However, reading Miranda’s take on life is frankly liberating. We all do stupid things, but actually it’s not the end of the world. How many times do we stop doing things (or never start) in case we look silly? I think we should all embrace our inner child and just not care. 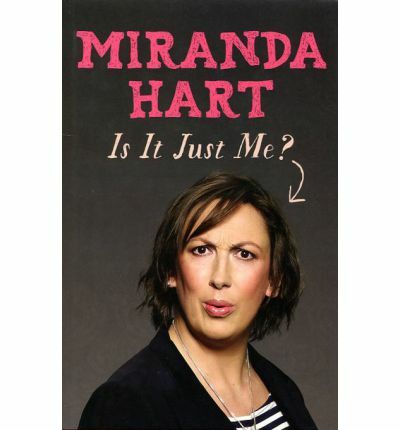 In fact I would go so far as to say that Miranda’s book should be made part of the national curriculum. We should all try just to make life a bit more fun. Miranda is a big advocate of galloping instead of plain walking, so if you want to gallop to work in a morning, then do it! There is high chance that you won’t see the people you pass ever again, and even if you do then in true British style no one is going to mention your galloping episode so get on with it. You might start a whole new craze. This book was excellent. I think Miranda is one of the funniest comedians around at the moment, and that I suspect ‘mdrc’ is not just me!